The Arabic alphabet contains 28 letters. These letters are divided in two groups, 14 sun letters ( al-ḥurūfu š-šamsīya – الحروف الشمسية ) and 14 moon letters ( al-ḥurūfu l-qamarīya – الحروف القمرية ). When a word starts with one of the sun letters and is preceded by the definite article ‘ al- ال ‘, the letter lām ‘ ل ‘ assimilates into the following consonant. 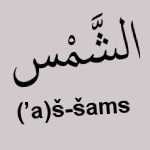 For example: ‘ the lesson ‘ ‘ الدرس ‘ is not pronounced ‘ al-dars ‘ but ‘ ad-dars ‘. The word starts with a sun letter ‘ d ‘. Therefor the ‘ l ‘ of the definite article assimilates into ‘ d ‘. These are the 14 sun letters: ت، ث، د، ذ، ر، ز، س، ش، ص، ض، ط، ظ، ل، ن . When a word starts with one of the moon letters and is preceded by the definite article ‘ (’a)l- ال ‘, the letter lām ( ل ) does NOT assimilate into the following consonant. 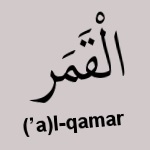 For example: ‘ the government ‘ ‘ الحكومة ‘ is pronounced ‘ al-ḥukūma ‘ and NOT ‘ aḥ-ḥukūma ‘. The word starts with a moon letter ‘ ḥ ‘. Therefor the ‘ l ‘ of the definite article does not assimilate into ‘ ḥ ‘. These are the 14 moon letters: أ، ب، ج، ح، خ، ع، غ، ف، ق، ك، م، ه، و، ي . Sun letters: the šadda ( ــّـ ) on the first consonant of the word indicates assimilation of the lām. Moon letters: the first consonant of a word is preceded by the definite article with a sukūn ( ــْـ ) on the lām.